Contains the most popular links based on our webpage statistics. Some of these are databases and/or tools such as Ovid Medline, Access Medicine, PubMed and EndNote. 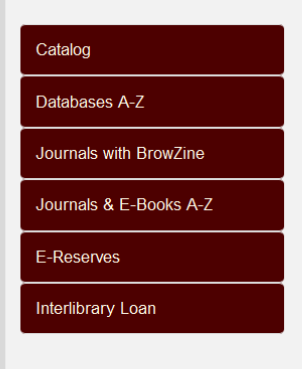 The maroon buttons highlight our most used tools which include the Catalog, our Databases A-Z which is a listing of all the databases that we subscribe to, Journals with BrowZine is a visual interface that makes browsing journals fast and intuitive by title, subject, or ISSN, Journals & E-Books A-Z takes you to our complete collection of journals and electronic books available in our catalog. E-Reserves takes you to our electronic reserves and sign-up form for Faculty. This section highlights the library's recent announcements, news, and events from our blog. Provides an easy way to access our services. 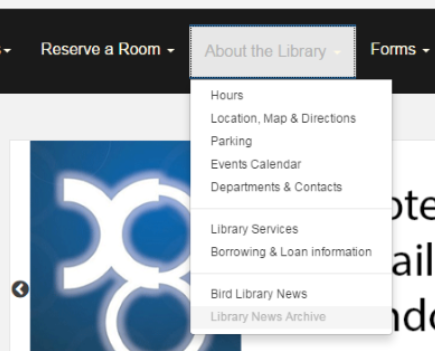 Library Services takes you to an A-Z list of our online and on-site services we offer to the OUHSC community and the public, it also lists the locations of our various collections throughout the 3rd & 4th floor. References & Consultation includes instructions on getting help from our Reference Librarians as well as general information about our Reference Department. Research Tools provides guidelines on obtaining research and writing assistance and how to manage citations and full text. College Resources list the current resources that the library has specific to the college. FAQs details our frequently asked questions. History of Medicine is our digitized special collection of archives. Robert M. Bird Society details the history of Dr. Robert Montgomery Bird and the Bird Society which comprises OUHSC alumni that help to support the library and its endeavors. To search our entire website utilize the search form at the top right. Your search term will be filtered on the results page by databases, website pages, or frequently asked questions that match your search term query. The home page also features the current weekly hours, a quick document search using PMID, and our Twitter feed in real time. Our revamped website footer now gives you more information within one click. 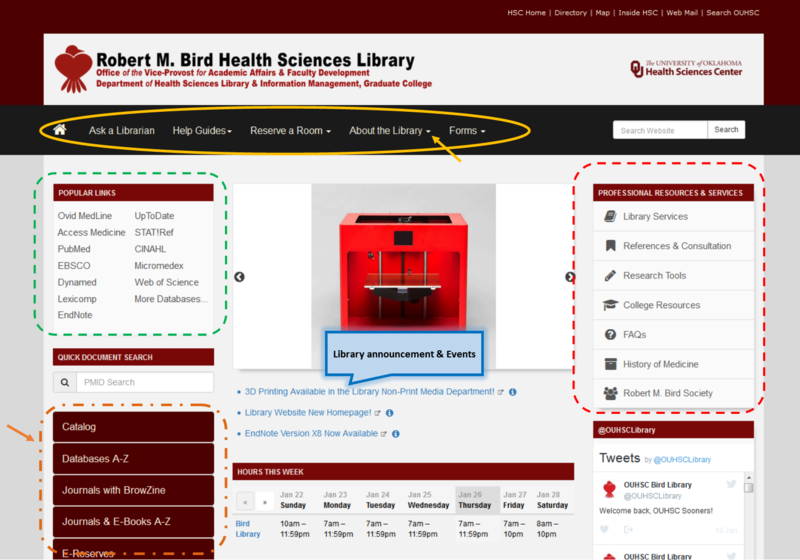 Eventually it will carry throughout the entire webpage, so you will always have access to our location, contacts, phone number, hours, parking and borrowing information, quick links such as the catalog, databases, news, etc., library services, twitter, and other OUHSC campus resources.